280 characters can destroy a nation. USA Today bestselling author Fiona Quinn pens a romantic suspense thriller where social media is weaponized. Avery Goodyear, a romance editor from the suburbs, becomes a player in an international game of psychological warfare. Russia is playing mind games. The FBI watches the attacks unfold in real time. The enemy’s strategy: win hearts and minds to destroy American unity. The FBI focuses their secret weapon, ex-Army Ranger Rowan Kennedy, at the crisis. With a PhD in propaganda, Kennedy risks his life to expose the wealthy oligarchs and high-powered schemers threatening our way of life, and to protect Avery. To beat the enemy at their own game, Rowan and Avery must break the rules. It only complicates things that they’re falling in love. The game is on. The set is in play. Who will win the match? in this military romance and psychological thriller filled with spies, conspiracies, and political corruption. 5.0 out of 5 starsIntricate action thrill ride with great characters and side of romance. Oh my Fiona does it again! Open Secrets is definitely worth the read! It is a intricate action thrill ride with great characters and side of romance. Meet Avery and Rowan an editor and a FBI agent that have built a cyber "friendship" over the years due to their mutual love of writing, not knowing their worlds will become enmeshed not just because of their interests, or growing attraction, but because the cyber world where their relationship started and grew has a very dark side. That dark side will draw them into a game of espionage, powerful players and a number of ragtag groups that could cause a lot of destruction. 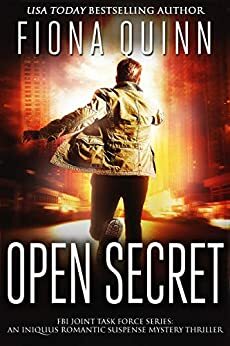 Open Secrets can definitely be read as a stand alone, but if you are a fan of Fiona Quinn's Iniquus stories you will love seeing them play a role in helping to resolve this potentially explosive situation. Open Secrets will definitely keep you turning the pages and will keep you up at night, so be aware once you start mostly likely you will not want to stop until after the last line! In spite of the amount of time I spend reading books, I’m totally a movie girl when it comes to imagery. And in that vein, this story felt like an unholy cross between Live Free or Die Hard and there were some moments that I felt were channelling The Purge. Now these are not two movies I’ve ever thought of in the same sentence before, but they have the right concepts to match the terror-inducing plot the author has created with this book. The reason I find it so terror inducing? I can’t prove that any of this isn’t happening at this very moment. I’m going to go put on my tinfoil hat now and find a small, lead-lined casket for my cell phone… Or maybe a large one to hold all my electronic devices. 5.0 out of 5 starsGreat romantic suspense! This is an amazing and timely book about the efforts of a foreign country to use novels, music, and computer games to spread dissension and conflict in the United States to work on destroying it from within. As a retired high school psychology teacher I have always been interested especially in how violent, realistic computer games encourage users to become violent in the real world. The book is really scary in how well it relates to foreign countries trying to interfere with American elections and sow seeds of division and conflict within the population. I highly recommend this book to those interested in psychological techniques and political conflicts between nations. 5.0 out of 5 starsRomance, espionage and intrigue oh my! This story reads like a movie! The attention to detail, the intricate scheming and action. It was an exhilarating and kind of scary thrill ride. We meet Rowan and Avery, two very likable people, in a situation that's all too believable and just steps away from world wide terror. But all is not lost because there are some very familiar faces in this latest installment in the Iniquus world. Grab this book, you will not be sorry! I liked this new thriller by Fiona Quinn, but it scared the hell out of me. Includes familiar characters from her Iniquss series plus new ones working for the FBI. Suspense romance with scenes that would have made my mother blush, Open Secret will appeal to anyone who likes action - between the sheets and or dodging bullets. The story is about how our enemies are using psychological warfare against us by using our freedoms to infiltrate and destroy our democracy. They don't have to shoot us - we will just start shooting each other. Top-notch writing that keeps you on the edge of your seat.